One of Russia’s largest defense contractors has received a patent for, of all things, a shotgun-wielding flying drone. A video uploaded to YouTube shows the drone, which sounds like a chainsaw, blowing away flying targets before making a landing. Whatever bright days you thought lay ahead for humanity, the future is full of things like flying, man-hunting shotguns. The drone was patented by Russian defense manufacturer JSC Almaz Antey, according to Dambiev, a Russian defense blog. Almaz Antey is responsible for some of Moscow’s most advanced weapons, including 40N6 missiles for the S-400 “Triumf” long range surface-to-air missile system, one of the most advanced missile systems in the world. Work on the 50-pound drone began in 2016 and was carried out on behalf of Almaz Antey by the Student Design Bureau of Aviation Modeling at the Moscow Aviation Institute. With a flight time of 40 minutes, the drone is controlled by an operator wearing a visor who aims the shotgun through a live video link and sighting system. While it may look like nothing more than a R/C airplane with a shotgun installed, one has to remember that all non-autonomous drones are basically scaled-up remote controlled airplanes, ships, and tanks. The unnamed drone seems to continue the company’s “if it flies, it dies” theme. Instead of a regular, aerodynamically shaped nose like pretty much any other drone, it has a 12 gauge shotgun barrel. Indeed, the entire front half of the aircraft is actually a fully automatic version of the Vepr-12 shotgun, minus a totally unnecessary shoulder stock and pistol grip, because flying shotgun bots don’t have human shoulders. The Vepr-12 is externally similar to the AK series of Russian assault rifles, but instead fires from a magazine of ten 12-gauge shotgun shells. The video shows the drone taking off from a tail-sitting position, quickly shooting down a large red balloon, then downing a remote controlled airplane a few minutes later, before returning to land in the tail-sitting position. The use of a shotgun instead of a rifle or pistol makes perfect sense. As any duck hunter will tell you, the dispersed pattern of tiny shotgun pellets is more effective at hitting small moving targets than the single bullet from other firearms. Flying drones are particularly fragile, unable to adapt if their aerodynamic profile is altered by even the slightest damage. Here’s an interesting question worth pondering: is this new drone, designed to shoot down other flying objects, technically an unmanned fighter plane? 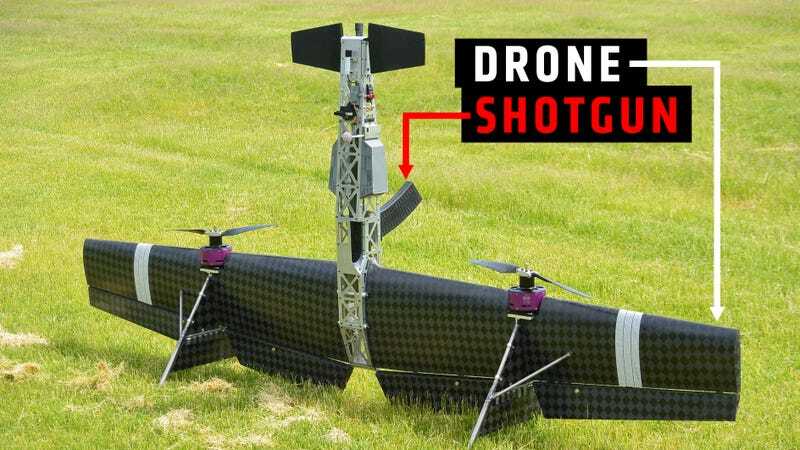 Russia’s shotgun drone is obviously a technology demonstrator—or more properly a student project—but souped up it could be a promising weapon system, both against other drones and people. It’s not as fancy as a drone that will drop a 250 pound satellite guided bomb on you, but a flying, human-aimed shotgun that hunts down its enemies is a uniquely terrifying prospect. War, as it is, is already horrifying. Now add a swarm of thousands of shotgun-wielding flying robots.